Wild pollock is a stunning fish with green-bronze flashes running down its sides. 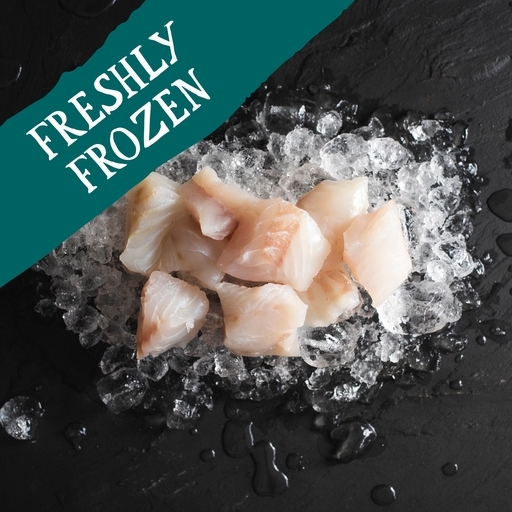 Ours has been line-caught by small inshore boats, making it a fantastic sustainable alternative to its close relative the cod, with clean white flesh that stays firm and flakes beautifully when cooked just right. We’ve cleaned, de-skinned and diced it for you, ready to cook in simple and speedy stews, curries and fish pies. Serves 2. Don’t miss our wild pollock. We buy from small local fishermen, so supplies are limited. It will be available for deliveries from 18th February, while stocks last. Try frying on a high heat for 3-4 mins with some chilli and spice and tucking them into a taco or wrap. Or thread them onto skewers with some fast-cooking veg and grill for 6-8 mins, turning often. They are ideal for stirring into curries or stews and will cook through in a matter of minutes. Make sure they are cooked through before serving, but take care not to overcook. Prepared in a kitchen where Celery, Cephalopods, Crustacea, Dairy, Eggs, Fish, Gluten, Molluscs, Mustard, Sesame, Shellfish, Soya and nuts are also handled.